Celebrating Porsche’s 17th victory at Le Mans I’m posting pictures I took inside the Porsche brain trust at Le Mans 30 years ago. 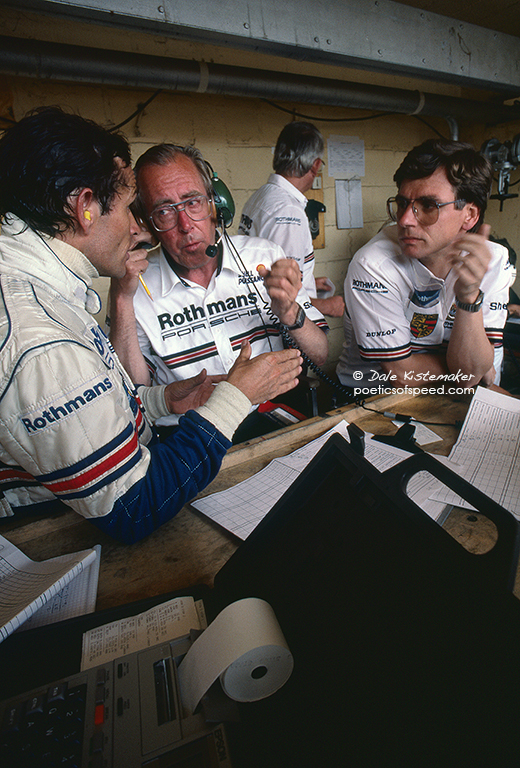 Left to right the great Le Mans driver Jacky Ickx, Peter Falk, Director of Racing and Manfred Jantke, PR Manager. Awesome pic… congratulations!!!! It’s nice to see the particular side of the racings. Press Box With Unused Typewriter And Blank Paper - 1985 Belgian Grand Prix, cancelled because the new track surface could not survive the powerful F1 Turbo Cars.